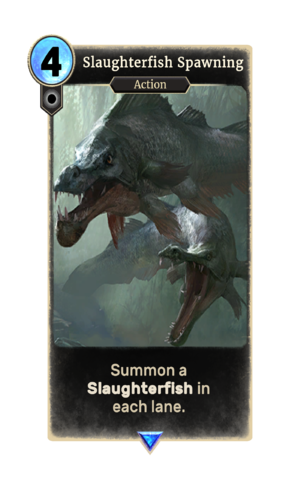 Slaughterfish Spawning is a rare Neutral action card. It is part of the Core Set. This card was previously part of the training mechanic where it could be upgraded from Slaughterfish at level 28. Prior to January 2017, this card had a cost of 3. This was changed due to a lack of effective countermeasures at that cost. This page was last modified on 14 February 2019, at 11:23.